Are you getting your home ready for another notorious Michigan winter? Do you know how to prevent some common problems that could end up costing you money down the road? Are you unsure of how to take the proper steps to prevent things like ice dams? If you answered ‘yes’ to any of these questions, Coverall Roofing has got you covered! As the premier roofer in Clinton Township, Coverall is prepared to help you deal with the not-so-fun parts of winter, including things like ice dams, which can be a huge problem for your gutters. One popular myth is that a heated roof in the winter will melt the snow, but the truth is that a cold roof is better! With a cold roof, the snow on the roof will eventually melt, but won’t leave large amounts of water, which could lead to leaks in your attic and in your gutters. Your attic also needs to be properly ventilated and insulated. Coverall Has Got You Covered! For more information, check out our blog! 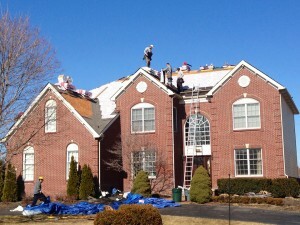 Coverall Roofing is the premier roofer in Clinton Township, and we want to help you get ready for the busy winter ahead!